For the 2016 Summer Olympics in Rio, more women athletes are competing in the games than in any other Olympics that have come before. It has thus come to the attention of Olympic organizers, watchers and the media some of the most significant changes and latest trends where women Olympians are concerned. One of the largest buzzes in the games would be the female Middle Eastern athletes, specifically what they are wearing and what they are winning. 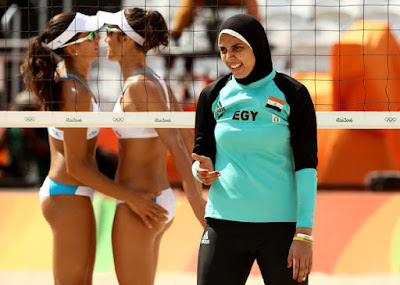 A major big deal was made about the Egyptian women’s beach volleyball team going into battle against the usual bikini-clad German duo while they were modestly covered head to foot, with player Doaa El-Ghobashy wearing a hijab headdress. Highly conservative cultural mores have long stifled the desires of Arab women to compete in sports. Perhaps the biggest trigger for change in the status quo came in Los Angeles 1984 when Nawal El Moutawake of Morocco won gold at the women’s 400 meter hurdles, the first Olympic gold for her country. The king of Morocco gave her his full support, and El Moutawake became a poster girl for other Arab and Muslim girls with dreams of making it big in sports. Nowhere is this change made clearer than in Rio 2016 which saw a goodly number of female athletes competing for some of the most conservative Arab countries yet. But some very strict elements from the religious community still can’t help but stir up trouble for these progressive steps. These opinionated and very loud reactionaries are gathered together under the Arabic hashtag #Olympics_Women_Don't_Represent_Us, which call for all Islamic countries to stop sending their women to compete in sports. And this online movement has spat some very hurtful venom at those who do not toe to their conservatism. Libyan swimmer Daniah Hagul, who chose to wear a conventional swimsuit to compete, was slammed by conservatives with hateful comments. Syrian refugee and Olympian Yusra Mardini had people wishing on video comments that she had drowned as punishment for being “naked” in public. A liberal Egyptian columnist, Khaled Montaser, expressed concern about these attitudes concerning Muslim women not acting as conservative more say they should. Posting a picture of Egyptian women in the 1960s playing basketball in shirts and shorts, he criticized the Egyptian Olympic Committee for insisting that the beach volleyball team be covered up. It seems female Arab athletes get some heat no matter what they do or wear. She is an Alpine skier, also she's fans around the globe because Best Sexiest Female of her stunning appears and amazing skills. Her ski stats are all excellent.